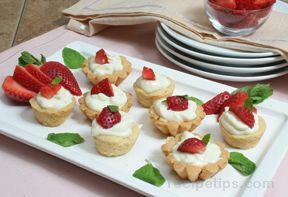 Elegant tart that is perfect for any occasion. The almond flavor comes through in the extract and the toasted almonds. 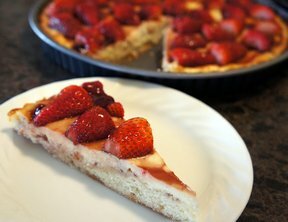 The toasted nut combined with the sweet and tart strawberries will put you in heaven. Preheat oven to 350 degrees F. Grease a tart pan or 9-inch springform pan. For the crust, combine sugar and butter until creamy. Add egg and almond flavoring; continue beating until combined. Add flour and baking powder; continue beating until well mixed. Gently press dough into prepared pan. Sprinkle toasted almonds over dough. 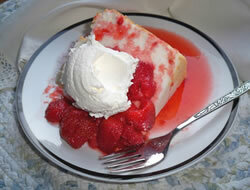 For filling, combine sour cream, sugar, eggs and almond flavoring. Beat until smooth. Pour over almonds. Bake for 60-70 minutes or until edges are lightly browned. Cool on a wire rack completely. 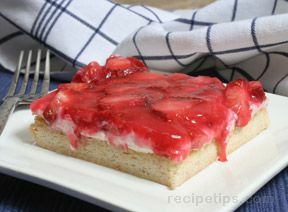 Arrange strawberry halves on top of cake. Brush with melted jelly. Refrigerate at least 2 hours before serving. "Perfect strawberry dessert. I loved the combo of the almond with strawberries. This doesn't keep since the crust gets soggy but that shouldn't be a problem...everyone will gobble it right up."